A new threat has risen its head in northwestern Dardarrick, and the regular military cannot be taken way from their posts now that Lorn has started a new war to the east. Supplies necessary to the military effort have been stifled, entire caravans gone missing, and cattle ranches have been turned to charnel fields. Fortunately for the people of the area, Wraith Recon is on the case. Their mission: to stop whatever is threatening the northwest and make it safe for Dardarrians again. 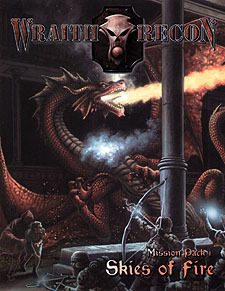 Skies of Fire is a mission and scenario pack for the Wraith Recon game setting, designed for four to five Wraith Recon characers of 4th - 6th level. The missions take the characters through a variety of situations and circumstances that will require them to use every facet of their training, equipment and courage they have at their disposal. It is time to pack your gear, Wraith. Dardarrick needs you yet again.